This is a busy week. I’m so excited that Brit’s Pub invited me to play their ‘St. George’s Day’ celebration (the English version of St. Patrick!!). 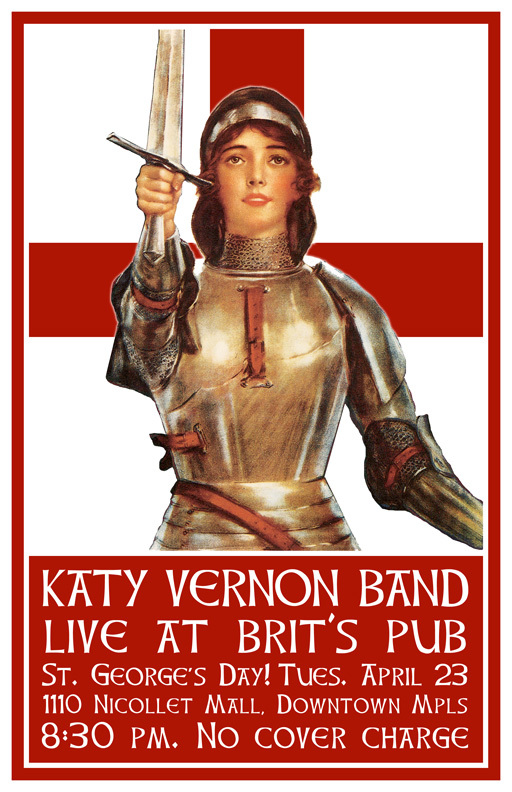 It’s going to be a really great night of food and drink specials and a 2 hour set by the full Katy Vernon Band. They said they considered getting a British cover band and then remembered there’s a real British band in town! Funny. So that’s this Tuesday, we play at 8:30pm and there is no cover. The always amazing Doug Bratland made this cool poster for it. Then two days later I’ll be joining up with my friends ‘Those Were The Days’ and ‘Fab Tab and the Ted’s’ for a double header celebration of the music of the 1950’s and 60’s at Lee’s Liquor Lounge. If you’ve never been to Lee’s you have to check it out. It’s the perfect venue for this kind of show. You really feel like you are back in time. Finally here’s a wonderful new review of the record. There’s always an element of be careful what you wish for when you submit your work for review but I couldn’t have wished for better than this. It’s amazingly rewarding and encouraging. Thank you for your support. Katy.